Terrorists throw pipe bomb at IDF position near Binyamin community of Psagot. Nobody injured and no damage caused. 11 terrorists arrested. 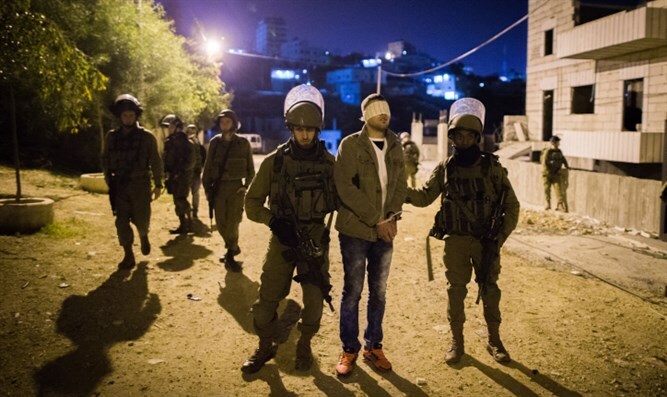 During the weekend, IDF, Shin Bet, Border Police and Israel Police forces arrested in Judea and Samaria 11 wanted terrorists suspected of involvement in terrorist activities and violent disturbances against civilians and security forces. The IDF Spokesperson's Unit said that overnight, terrorists detonated a self-made pipe bomb at an IDF position in the area of Al-Bireh, near the Jewish community of Psagot in the Binyamin region. There were no casualties and no damage was caused. It was also reported that during searches carried out by IDF soldiers and Border Police forces from the Binyamin Brigade in the area of ​​the village of Anata in the Jerusalem area, the fighters seized five self-manufactured weapons and an M-16 weapon. The findings were transferred to security forces.